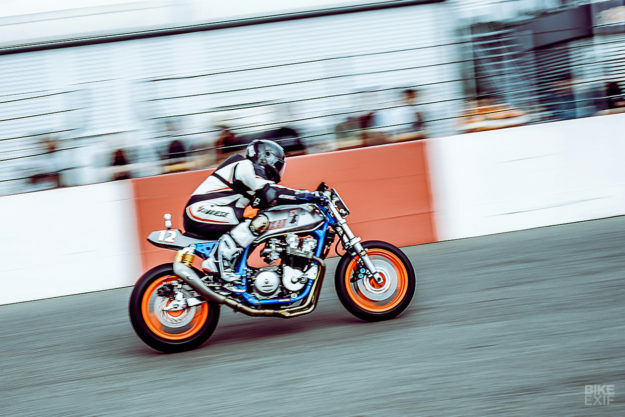 In this santized world, there’s a lot to be said for a big, bruising 1980s superbike. 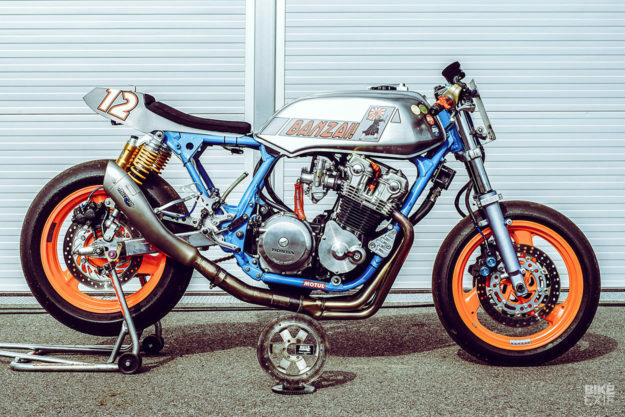 And they don’t get much ballsier than Honda’s CB900F. Although it was designed for Europe, the air-cooled straight four was a smash hit in the USA with journalists and owners alike. 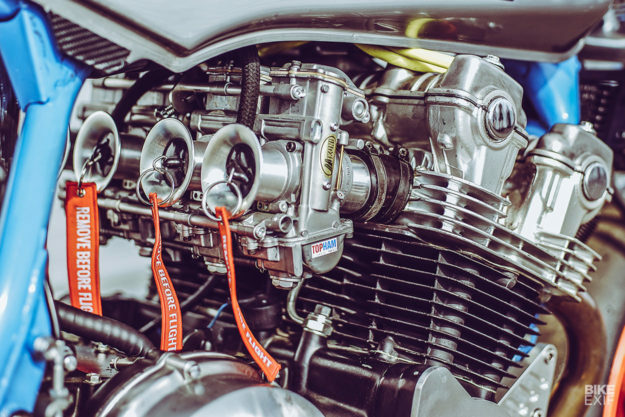 Every now and then, a CB900F will pop up in the EXIF inbox and make it onto the site. But we doubt if many can match the speed of this German-built racer. 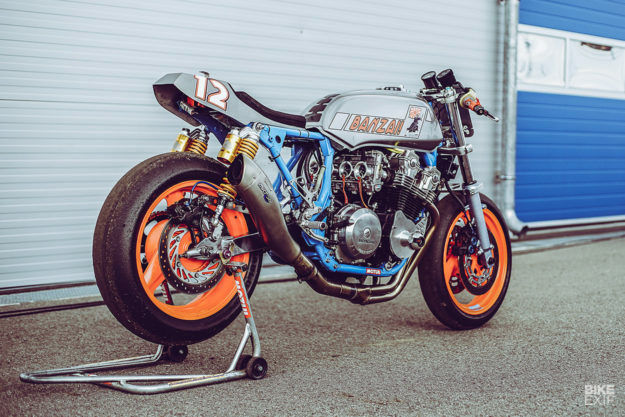 The story of ‘Banzai-Bolle’ is entwined with the ‘Built not Bought‘ race. Never heard of it? Neither had we. 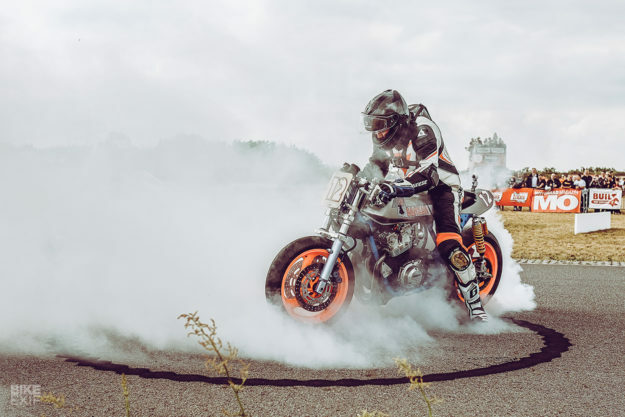 It’s a three-day event that happens once a year at the Spreewaldring circuit, an hour south of Berlin, and it sounds totally bananas. That sounds like our kind of gig. Especially when the start line is graced by machinery like this. 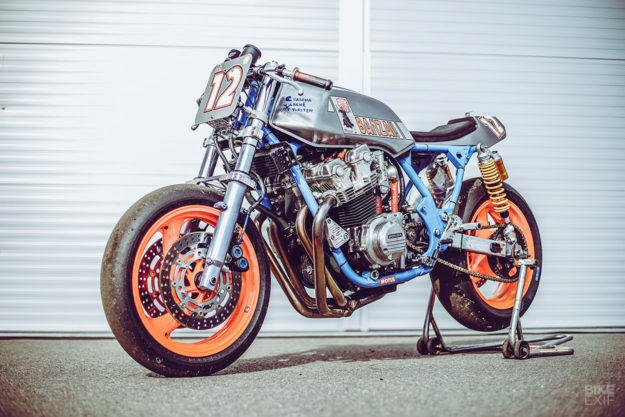 To be precise, it’s a 1983 SC09 ‘Bol d’Or’ model, it’s a two-time winner in the Classic Superbikes class, and it epitomizes the chaotic spirit of the event. 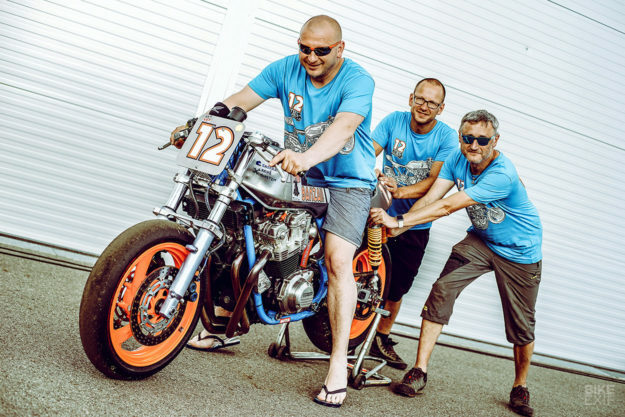 It’s fielded by the oddball ‘Banzai’ team, consisting of racer Sascha Bellon and mechanics René Freudenberg and Torsten Friebel. The trio have been racing ‘Banzai-Bolle’ for four years now—but it took a few rebuilds to reach podium form. The early stages of development reportedly left the bike less and less rideable, with tales of oil leaks and unscheduled fires. Last year, pilot Sacha kept scraping the side covers in corners, so for 2018 the team brainstormed ways to improve the lean angle. They also had the small issue of a blown con-rod bearing to fix. With an ethos of keeping things as DIY and cheap as possible, the Banzai trio set to work. 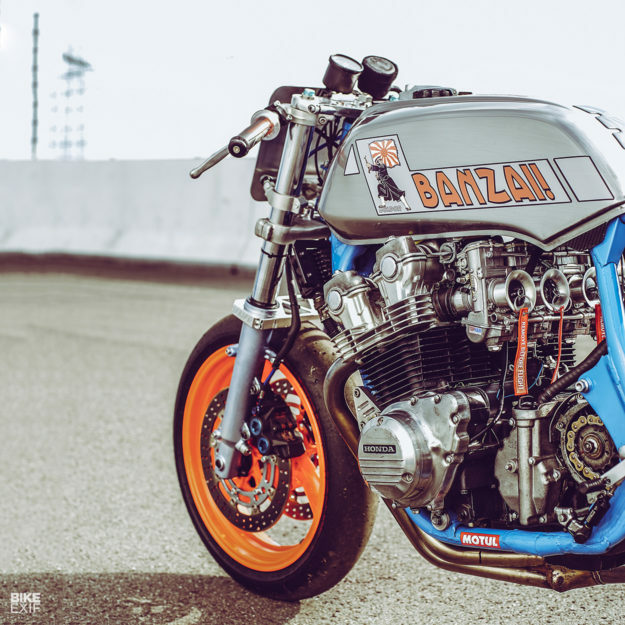 This Bol d’Or is now sporting 985 cc Wiseco pistons, a balanced crank with polished con-rods, and an upgraded clutch. The heads have been optimized too, thanks to countless hours put in by Sacha and a Dremel. 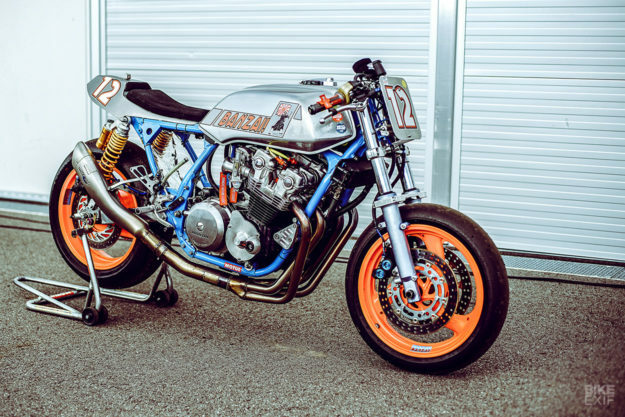 Banzai-Bolle now breathes in via a set of Mikuni TMR 36s, and out via four-into-one Scheibel headers and a Micron silencer. The combo looks pretty wicked, and we’re betting it has the sound to match. His mix of aggression and control on the track not only inspired the team name, but also prompted a serious chassis overhaul. The team needed a donor bike to scavenge for parts. 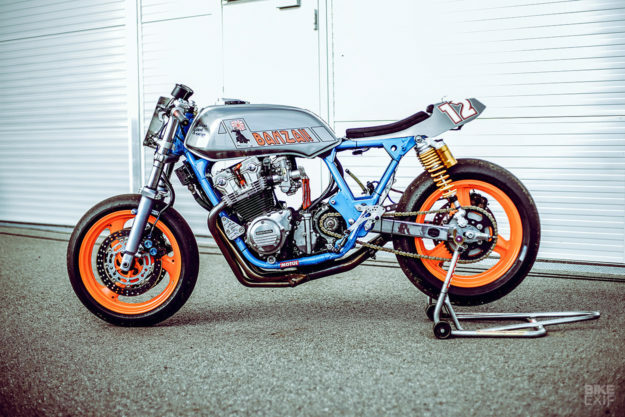 “A Ducati would have offered better parts, but was too expensive,” they say. So they settled for a late-90s Yamaha YZF1000R Thunderace, grabbing its front forks, brakes, wheel and clip-ons. A custom fork stabilizer and a Suzuki GSX-R steering damper off complete the new front end. The rear wheel’s from a 1989 CBR1000, and is hooked up to the CB900’s solid OEM rear brake system. The frame itself has been shortened at the back, cleaned up and reinforced in various spots. 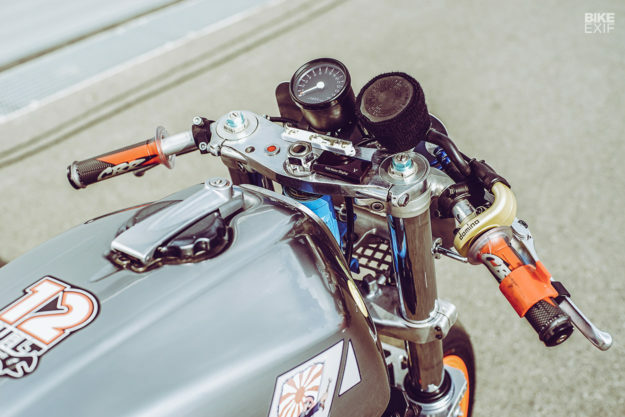 Up top is an alloy tail section, borrowed from an old 50 cc Simson racer and in front is the stock CB900F fuel tank—but polished, clear-coated and adorned with the team’s own decals. Under the hood, the crew have stripped down the wiring loom, ditched the starter motor and installed an Ignitech ignition. There’s also a set of custom-made foot pegs and a gearbox blipper. Even though the Banzai-Bolle took 1st in its class at the 2017 event, most of the work listed here took place over this past winter. So it’s little wonder that the team repeated their success this year, sticking it to some pretty exotic machines in the process. Everything happened at Sacha’s place—always after hours, and often over beers. And you can bet they’re nowhere near done; they’re already planning a carbon fiber version of the tail section. With thanks to Sven Wedemeyer / WHEELS OF STIL for the photos and tip. Burnout image by Klaus Angermann.